This delightful item was deposited with the Archives as part of the records of Bridge of Allan Golf Club, donated to the Dr Welsh Trust earlier this year. The achievement by Walter McFarlane was also recorded in the Stirling Journal for 21st June 1928 in its ‘Golf Notes’ column. Walter McFarlane is given in the valuation roll for Bridge of Allan Burgh for the year 1928 – 1929 as renting accommodation at ‘Craigview’ a house on Fountain Road in the Burgh along with a number of other tenants. His occupation at this time is given as ‘motor driver’. His name also appears in the competition records of the Club that survive for the early 1930s. He appears to have been a keen player. The certificate remains in the cardboard tube in which it was delivered to the club. The mystery is, why did Walter not collect his certificate? The ‘Johnnie Walker’ brand of whisky has long been associated with golf, the company has sponsored various competitions over the years. The supply of certificates to mark those fortunate golfers skilful enough to get a ‘hole in one’ must have been part of their advertising campaign at this time. 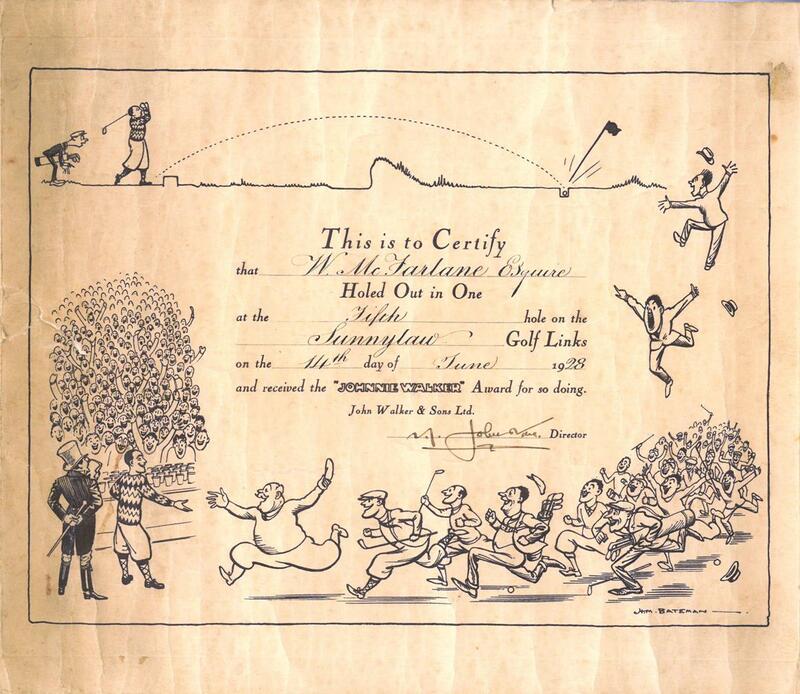 The design of the certificate centres around a cartoon by H.M. Bateman who was a very well known cartoonist at this time. Henry Mayo Bateman (1887 – 1970) was best known for his cartoons in ‘Punch’ magazine including his series of gentle satires on British life ‘The Man Who...’. He was known for his cartoons lampooning the game of golf and the people who played it.